What is Assassin’s Creed 04 – Revelations Audiobook? Penguin presents the unabridged, downloadable audiobook edition of Assassin’s Creed: Revelations, the new novelisation based on one of the biggest gaming-media franchises in the world. Read by the actor Gunnar Cauthery. The Secret Crusade’s story follows Altaïr, as told by Niccolo Polo. It details the life of Altaïr, an Assassin; beginning with the death of his father. Altaïr watches his father’s execution; which was carried out for causing the unintended death of a noble. Sometime later, he also watches one of his father’s fellow Assassins kill himself out of guilt over the death of Altaïr’s father. 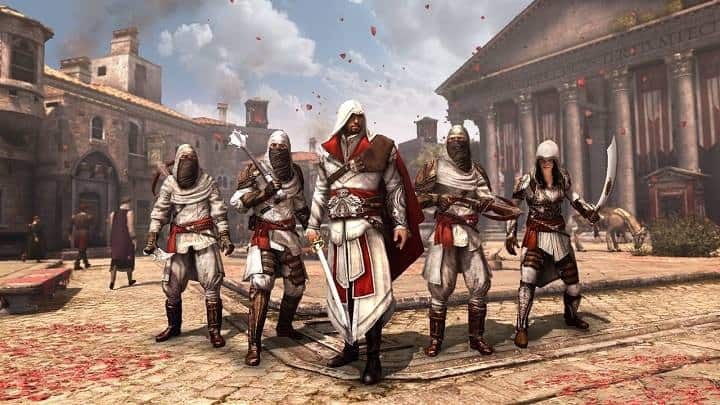 Altaïr soon begins to train under Al Mualim, leader of the Assassin Order. Al Mualim instructs him not to tell his fellow Assassin Abbas of his father’s suicide. Despite this, Altaïr tells Abbas, who receives the news poorly. The news that Abbas’ father killed himself causes problems between himself and Altaïr. The Secret Crusade then progresses to many years later where an older Altaïr with his wife, Maria; and their son, Darim; are returning to Masyaf Altaïr’s home after successfully assassinating Genghis Khan. In their absence, Abbas proclaimed himself “Master of the Assassins” and taken over Masyaf, ruling with tyranny. Altaïr is met with cold indifference. He discovers that despite being told that his son Sef had traveled to Alamut, his son was actually murdered by Malik. Malik has been imprisoned but claims innocence. Altaïr breaks him out of jail planning to confront Abbas and reclaim his place as Master Assassin. These plans are thwarted when Abbas has Malik killed and frames Altaïr for his death. Out of anger, Altaïr uses the Apple of Eden to kill the man responsible for Sef’s death but also inadvertently causes Maria’s death. Devastated, Altaïr flees Masyaf.